This paper explores some of the conflicting priorities between childcare by for-profit entrepreneurs and non-profit or state systems. The paper considers the limitations of using the market as a workable model for the organisation and delivery of childcare. It presents a brief overview of the reach of economics as a basis for making decisions about childcare, and describes changes in ideas about the application of market principles to traditional welfare contexts. This Occasional Paper No. 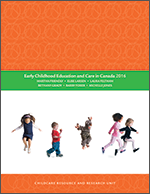 26 is available from the Childcare Resource and Research Unit (CRRU) in an online format only with the permission of the author. This paper is to be published as a chapter in the forthcoming book Childcare markets, local and global: Can they deliver an equitable service? edited by Eva Lloyd and Helen Penn, published by The Policy Press and University of Chicago Press (June 2012). It may be used for educational or research purposes with appropriate citation or with the permission of the author.